Guest Blog: Entrepreneur Stories: Kavita Oberoi, Founder and MD of Oberoi Consulting – Digital Recruitment and me. I was raised in a traditional Indian family. I owe my entrepreneurial spirit to my father. My father came over to England in the 1960s with nothing except the single minded intention to make his fortune. His sole purpose was to set up a business that would enable him to provide for his family. He left his wife and children in India whilst he set out to make his fortune. After watching a plumber at work he decided that he was going to set up a plumbing and heating business. My father was the mastermind and later brought his brother over from India to work on the manual labour whilst my father focused on the bigger picture. After a few years my father had made enough money to send for my mother and my elder brother and sister. The business grew organically, without business loans, and saw its first retail outlet open in Bradford in the 1970s. The business is now third generation with grandsons all running retail premises. There are very few people who can create wealth for generations to come and this all started with my father. Despite my father’s business successes he is remembered most for his generosity, philanthropy and the number of people’s lives he impacted in so many ways. My training started early between the ages of 2 and 3. I clearly remember going out in the car with my father to his business appointments. We lived above my father’s plumbing and bathroom shop for a few years before moving into a house. I was introduced to the world of business by helping my father and elder brother in his shop and where selling became an ingrained passion. At that time working and education was a cultural taboo as men went out to work whilst women entered into an arranged marriage and focused on bringing up their children. My elder sister got married at the age of 19. My mother played a huge part in encouraging me to seek out and achieve what I really wanted to do. She recognised my abilities and desire to learn and excel and nurtured this side of me. She was much more open, and used to sneak me out of the house to take part in ballet and tap lessons and covered up where I had been if my father questioned my whereabouts. My father died when I was 15 which put enormous pressure on my mother but she battled through all the controversy to support me in the things I wanted to do. I decided I wanted to get a Saturday job and managed to quickly secure a position with Richard Shops as a sales assistant. My weekend job caused uproar in the family, but my mother firmly put her foot down and supported me. Her encouragement led me on to gain O levels and A’ Levels. My ambition was to become a doctor, but I wasn’t allowed to because of the time it would have taken to complete the training. I would have qualified when I was 26 which was far too old for marriage and marriage, as soon as possible, was the priority. Instead I applied to study Chemistry at Huddersfield University, and commuted every day from home in Bradford. I was very focussed on my studies particularly as I wanted to prove people wrong. I graduated with a First Class Degree and I guess was a bit of a trail blazer in my family, breaking down the barriers, for others to follow. I was the first woman in my family to get a University Degree and be allowed to work. Now gaining an education and career are the norm for all girls in the extended family. During my time studying for my degree I spent a year out working in research at ICI. Although I enjoyed my time there it confirmed to me that I really wanted a job where I would be selling, working with doctors and have a company car. This attracted me to medical sales. Within a few months of graduating I got a job with Bayer Pharmaceuticals. Although, I’d begun my working career, there was even more pressure from my family who had introduced me to many prospective partners, by this time. A family friend from Derby suggested to my mother that they knew someone that would be a good match for me and when they told me who it was I realised that we had been at the same university and I already knew him. We decided to get married after only a few hours of meeting up again. We married and within the first month my husband’s mother died of breast cancer. This meant I was thrust into responsibility for running the home, looking after my father-in-law, sister-in-law and also trying to balance the commitments of work. Bayer had transferred me to manage their region in Trent, which was a huge challenge for a 23 year old, but something that I relished. I remember ringing my mum up for cooking lessons on most days. I can now cook like no-one else!! I guess you just get on with things and I was so grateful that I had been able to keep working and to this date I still do work around the clock to fit everything in. I’d been in Derby a little over eight years, during which time I had had two daughters. After my second daughter was born it was suggested by a work colleague that I should go for a promotion. It is important to have people that empower and push you in life so I convinced myself that this was the dream job for me and I was going to get it. It was quite a shock when I was overlooked because I was informed that I was too autocratic, didn’t possess the leadership skills and too much of a risk taker. I started going for interviews and it was then that I decided I’d never work for anyone else again. I could not face working for someone else for another 8 years only to be told I wasn’t good enough. This was the catalyst for me to set up Oberoi Consulting. I’d been working in the industry for over eight years, and new guidelines had just come out on managing heart disease and I found that doctors struggled to implement these guidelines. The first step was identification of the patients through a computer audit of their systems. I taught myself the clinical systems and started to produce the reports and guide the doctors in terms of recall of their patients and it was just what the doctors needed. I began to think that if I could take the idea to a pharmaceutical company it could support their brand growth, help doctors to reach their targets and improve patients care. About six or seven months after setting up my own business I got an opportunity to pitch the idea to one of the world’s biggest pharmaceutical companies. I was so passionate about the idea, believing in it completely, which must have shone through during the meeting. I walked out of that meeting securing a £0.5m contract, and not a clue of how I was going to deliver it, with no staff and working from a bedroom at home! A few months later the government released the new GMS contract and the need for our services went through the roof as everything was tied into data on their computer systems and points meant pounds for doctors. erent clients within the healthcare sector, from Primary Care Trusts, doctor’s practices, practice based commissioning clusters to pharmaceutical companies. We help them meet their targets in a more efficient way. The business has grown rapidly in a relatively short period of time. We have worked with over 5,000 GP practices across the UK and our client list is growing. It was about two or three years after I launched Oberoi Consulting that I realised I needed a prestigious office to attract blue chip clients. I’d seen the building that we currently occupy on Pride Park and had enquired about it, only to be told by the agent that it had been sold. I kept persisting and out of the blue the agent phoned to say that it was available. I bought the building, moved in and rented out part of the space to another business. We’ve been extremely fortunate, as the business has never had to rely on bank finance to fund expansion. I’m very much of the opinion that I’d rather have the money before I invest it, which has put me in a good position financially and also enabled me to look at other opportunities when they arise, especially in the recession. I have also been fortunate enough to invest at the right time in commercial property. In 2010, I became a co-owner of Octavian Security, which is a completely different business to my own. I had known the founder Sukhi Ghuman for some time, I looked at the business and saw the potential and just went for it. 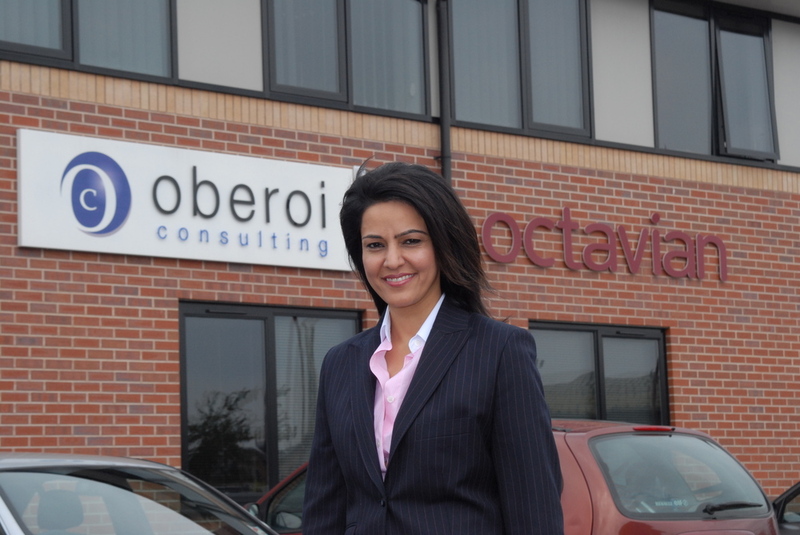 If you compare the two businesses, Octavian Security has over 500 employees across the UK and we are now growing internationally whereas Oberoi Consulting has around 30 employees. However, the latter has been generating far more profit, for me it’s all about the bottom line. Octavian has been another great learning curve for me and I believe that life long learning is really important. I also invested in another business in 2010 called “Adherence Science”, which specialises in the area of mobile health utilising mobile phones to support patients with medication, an exciting growth area. Getting involved in Octavian Security and Adherence Science has helped me realise that I’d like to work with more businesses and acquisitions. I built my business from scratch, learnt from my mistakes and believe that experience teaches us a lot, which I’d be keen to pass on. This type of mentoring, also sits well with some of the other work that I’ve become involved in within the voluntary sector. This all started with being on The Secret Millionaire, which was a brilliant experience and one which I very nearly missed out on. The programme makers approached me for the first series, but I turned them down. I realised that I made a mistake when I went on a trade delegation with a group of women to Mumbai, and met a woman who had set up the national spastic’s society across India She really inspired me and made me realise that I wanted to give something back. Two weeks after I returned and out of the blue, I received a phone call from the programme makers, I said yes straight away this time. During my Secret Millionaire experience I gave money to a GP practice that needed new premises to operate from. One of the doctors had a vision 30 years ago to set up advocacy and support services as drugs are not always the answer. I could see the impact this would have on the local community and I latterly went back to open a new building for them. The other story that really touched me, possibly because of the challenges I had faced growing up, was a group of ladies who were running a programme called ‘Sisters with Voices’ which aimed to empower women between the ages of 13 and 17. I’ve become a director with this charity and became involved in rolling out the programme to Derby, which is something I’m really proud of. Additionally, I’ve taken on a global charity role with the Girl Guides, which has similar ambitions to ‘Sisters with Voices’ but on a larger scale. I am Chair of the Global Girls Funds which I took on in April 2010. The Fund aims to raise £10m over the next five years and is dedicated to empowering all girls and young women to reach their full potential and take action to change the world for the better. I now give a percentage of my profits from my business ventures to the Global Girls Fund. This is another great and rewarding learning curve. I’m very fortunate as I have a strong team behind me, although I still retain a lot of focus in order to drive the businesses forward. I don’t think you can ever lose focus if you want your business to continue to succeed. Any time off I do have is spent with my family, so they can experience the things that I didn’t when I was growing up. Oberoi Consulting is my baby. It’s a very profitable business which has enabled me to invest in other things such as commercial property. Growth is important and everyday we get new opportunities both from the UK and internationally. It’s all about deliverability and making sure you have the right local knowledge to undertake these types of projects. I’m keen to invest in more start-up businesses and other companies of interest, if the right opportunity arises. Business owners have to keep an eye on their bottom line and finance management is also absolutely critical regardless the size of the business. Becoming a successful entrepreneur is about passion, focus and sacrifice You’ve got to realise that a business takes up a lot of time, there’s no quick win, just sheer hard work. The harder I work the luckier I become.